2018 saw Swansea City Council relaunch and reinvent their Swansea Pride event in SPRING! 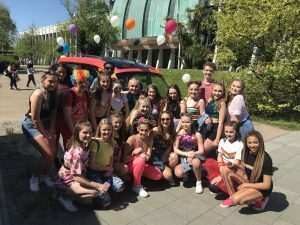 Yes, that’s right, Swansea got ahead of the game and hosted their event on Saturday 5th May 2018! Jermin Productions have always pledged their support for Pride within Swansea and the wider community and have been right behind the council supporting their efforts with this year’s Spring Pride Event. This year, we showed our support through a performance which exploding with colour, personality and PRIDE!! As we gear up for the Festival season we ensure that we have our body glitter, sparkly items and outrageously expressive outfits ready to shine in the summer sun. With all of that colour hidden in our wardrobes it was time for our students to test out their looks on this fantastic event! ‘Tis the season to be glittery, to get those sequins out, and to celebrate all things out and proud. To celebrate the fact that we have equality in so many areas of our lives, especially those in the LGBT+ community! On Saturday 5th May hundreds of people took to the streets of Swansea for the city’s first Spring Pride Event! The event was designed to raise awareness of LGBT issues and celebrate freedom and individuality within the Swansea City community. The sun beamed and with only rainbow colours in sight we were extremely proud to kick off the entertainment in true Jerminator style! We were in full support of the relaunch of Swansea Pride and decided to throw ourselves into the event which can only be described as a carnival of colour! The event began with a parade through the streets of Swansea before eventually arriving at The Swansea Waterfront Museum where our Jerminator performers were ready and waiting in position. For this event we wanted to produce a piece which was spontaneous, fun and represented everything that pride stands for. 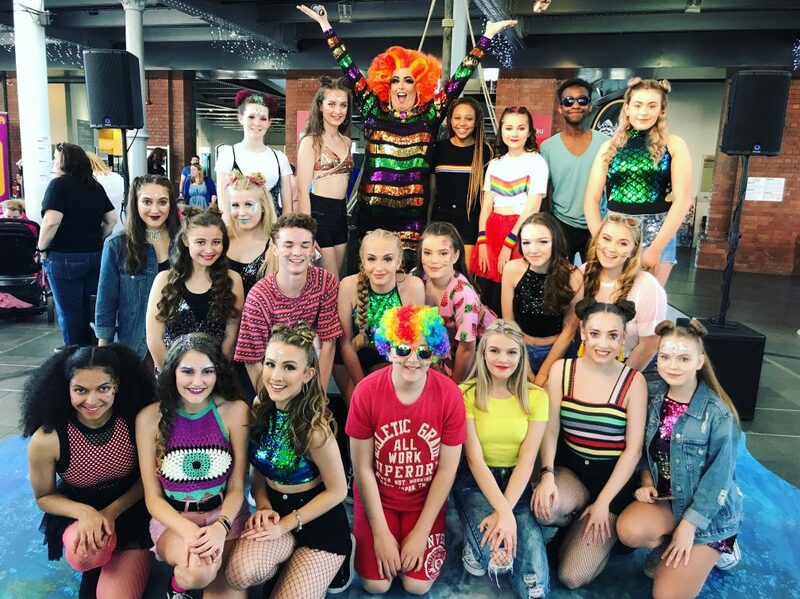 The students performed The Greatest Showman’s THIS IS ME as a flash mob and sported a mixture of technicolour, diamantes and tribal glitter! The day was extremely positive and supportive of everyone who attended! There were a number of stalls situated inside the Museum offering a splash of rainbow faceprint to anyone who passed before making their way out to the Street food Warehouse situated outside. The day was flooded with families, children and people of all ages who were all appreciating and enjoying the day equally. 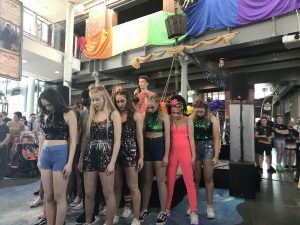 Our Jerminators did an incredible job of their opening flashmob and we are already looking forward to next year’s event! Hmmm what number could be perform at Swansea Spring Pride 2019? We have to say a HUGE Congratulations to Swansea City Council on what has been an incredibly successful first Spring Pride! We are excited to work alongside their team to grow on this local event and put Swansea Pride on the map! Swansea Spring Pride was one huge PRIDE filled step in the right direction!